We offer a vivid range of Marble Handicrafts to our global clients. 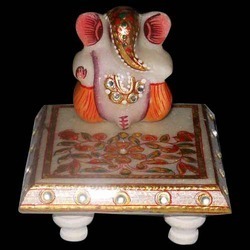 The range is made in quality materials and is true reflection of Indian Handicrafts and Arts. Available in variety of themes, designs and sizes, the range is offered at very reasonable prices. 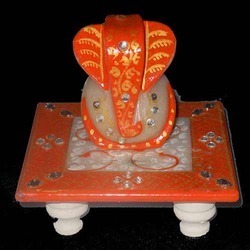 We are engaged in offering a beautiful range of Choki Ganesh. This range is manufactured by us by making use of superior quality raw materials and other embellishments. The range is intricately crafted by our expert artisans. We offer this range in varied models and sizes to meet the diversified client requirements. The range can be availed from us at best available prices in the market. This statue is beautifully adorned with ornaments and accessories such as a royal turban. All this artwork has been done with the help of hand tools and high quality paints.